A veteran Conservative MP is to stand down at the next general election. 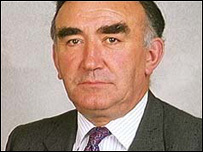 Michael Mates, 72, MP for East Hampshire was a Northern Ireland minister in John Major's government. Mr Mates said the next general election "will be fought on new constituency boundaries. This change seems the right moment for me to slow down". During his 32-year career, he led the Conservative opposition to the poll tax and was part of the Butler Inquiry into the justification for the war in Iraq. The announcement was made to the East Hampshire Conservative Association - Mr Mates has held the East Hampshire seat (previously Petersfield) since 1974. Mr Mates said: "It has been a pleasure and an honour to serve in the House of Commons for the last 32 years as the Member first for Petersfield and then for East Hampshire. "I am very grateful for the loyal support I have had from my electors over those years. "Meanwhile, I will of course be continuing to carry out my full duties as an MP until the end of this parliament."